This challenge is best done in a group of at least four and preferably more. You'll need to print out this sheet cut into fifteen separate cards. Share the cards out amongst the group. 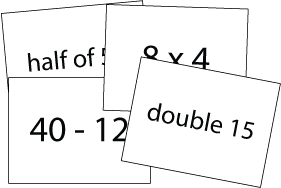 Can you each work out the number on your card? What do you notice? You may like to try using this sheet of twenty cards in the same way, which contain slightly harder questions. Practical Activity. Comparing and Ordering numbers. Addition & subtraction. Properties of numbers. Selecting and using information. Compound transformations. Working systematically. Interactivities. Visualising. Multiplication & division.